Peter Munk, founder and chairman of Barrick Gold Corporation puts on his trademark fedora at the conclusion of the company's annual general meeting April 30, 2014. He died at the age of 90. Peter Munk, a powerful man in a small frame, would claim he wasn’t afraid of death. It was frailty that terrified him; it meant that he could not play the game he had been playing all his life – building businesses, taking enormous risks, thundering like Lear when it all went wrong, then picking himself up, tilting his trademark Borsalino hat on his head and starting all over again, brimming with optimism. Mr. Munk, the Hungarian-born entrepreneur who turned Barrick Gold into the world’s biggest gold miner, just couldn’t stop, even as his health began to fail. He was in his late 70s when he spotted a clapped-out Warsaw Pact naval base in tiny, corrupt Montenegro and turned it into Porto Montenegro, one of the Mediterranean’s biggest and most glamorous yacht marinas and resorts. It is now home to some of the yachts of the Saudi royal fleet. At that age, he didn’t need the money or the aggravation. To him, there could be no such thing as retirement. He wanted to keep working, even if he had the wealth to spend his sunset years enjoying the yachts, the chalets and the private jets that went with his status as one of Canada’s best-known businessmen, patriots, Holocaust survivors and philanthropists. Mr. Munk died on Wednesday in Toronto, surrounded by his family. He was 90. The cause of death was not disclosed, but he had had several heart operations in recent years at the Peter Munk Cardiac Centre at Toronto General & Western Hospital. He had worn a pacemaker since he was in his mid-70s. When he was struck by heart problems, Mr. Munk resisted slowing down. At the time, he was still chairman of Barrick, still skiing with his family in Klosters, Switzerland, where he had owned a chalet since 1972, and still boasting to friends about his virility. Poor health inevitably caught up with him. He was forced to give up skiing in 2012 – Prince Charles, actor Deborah Kerr and writer Irwin Shaw had been among his ski friends – and he had to cut back on transatlantic flights, making his appearances in Europe increasingly rare. In his last year or so, he mostly divided his time between Toronto and Lyford Cay, the exclusive gated community in the Bahamas where he recently bought a villa. Still, he would become irate when various newspapers, including The Globe, carried stories about his imminent retirement, as if he were a scarred old lion ready to expire on the savannah. Such stories would inevitably trigger a blast from Mr. Munk for “implying that I am just about dead,” as he told a Globe reporter in 2016. In the business world, Mr. Munk was best known as the driving force behind Barrick, whose falling value on the Toronto stock market in recent years filled him with rage and anxiety. Among Canadians, he was perhaps best known for the Peter Munk Cardiac Centre, which he and his second wife of 45 years, Melanie, established in 1997 at Toronto General Hospital and funded with more than $175-million from the Peter & Melanie Munk Charitable Foundation. Of that amount, $100-million came last year and was the largest single gift ever made to a Canadian hospital. He was also known as the sponsor of the Munk Debates, which put Toronto on the global debates map. Over the years, its combatants have included Tony Blair, Nigel Farage, Paul Krugman, Malcolm Gladwell and Henry Kissinger. Last April, he donated $5-million to the Munk Debates to ensure it would endure in his absence, bringing the total gift to $12-million. The Munk School of Global Affairs at the University of Toronto, his alma mater, was another inspiration. The Munks’ foundation has donated $47-million to the school, with another $15-million pledged. The U of T was overwhelmed by his generosity. Among Canadian patriots, Mr. Munk is something of a hero. At one point during the great “hollowing out” of Corporate Canada – roughly the middle part of the last decade, when Inco, Falconbridge, Algoma Steel, Dofasco, Stelco and dozens of other industrial and resources companies were picked off by foreign buyers – he charged into The Globe’s offices in Toronto to tell the editorial board that the sell-off had gone too far. Peter Munk is photographed at a Barrick Gold annual meeting on May 1, 1997. He came alone, sporting his trademark fedora, monogrammed Charvet shirt and Order of Canada medal pinned to his lapel. Not even his Barrick PR team knew that he had snuck off to the newspaper to rail against the takeovers that were turning Canada into a branch plant economy. Mr. Munk was right. After the hollowing out, Toronto, ostensibly the world’s mining capital, was home to but one world-scale mining company – Mr. Munk’s very own Barrick. During the editorial board meeting at The Globe, he mused about putting Inco and Alcan together with Barrick to create a diversified mining giant, Canada’s answer to mighty BHP Billiton, Rio Tinto or Anglo American. By then, it was too late. Inco went to Brazil’s Vale and Alcan to Britain’s Rio. Riding the gold surge, Barrick would go on to become a takeover- and wealth-creation machine, although it nearly crippled itself a few years ago under the weight of mine-development cost overruns, especially in Latin America. Today, at about $19-billion, Barrick is worth less than half of its 2011 peak. But the worst is over, and the company’s headquarters are still in Toronto. Mr. Munk insisted that Barrick’s management team, now led by executive chairman John Thornton (there is no CEO), keep Barrick’s head office in Toronto. Mr. Munk was the proudest of Canadians and used many of his public appearances to thank his adopted country for accepting him and his family unconditionally after the Second World War and giving him the opportunity to make his fortune. “He has regarded being Canadian not as a taken-for-granted act of citizenship but as a badge of honour that he had to earn – and keep on earning,” Peter C. Newman said in his book, Dreams & Rewards: The Barrick Story. To the very end, he had a brain as sharp as can be. We all dream of the kind of energy he had at his age. His big fear was not being on top of everything, of becoming an old man who couldn’t do what he wanted to do. Nina Munk, Mr. Munk’s journalist daughter and unofficial family historian, said that Canada was a “dream” to her father. “He often recounted stories of how, within days of arriving after the war and enrolling in high school, he was being invited to his classmates’ homes and how their welcoming parents served what seemed to him unimaginably lavish meals,” she said. Mr. Munk was born in Budapest on Nov. 8, 1927, into a socially prominent and well-to-do Jewish family. He was an only child. His father, Lajos Munk (who would be known as Louis after he moved to Canada), lived a privileged life thanks to the wealth accumulated by Lajos’s father, Gabor, and his grandfather, Avraham. Gabor had made some money through the ownership of the distribution rights in the Austro-Hungarian empire for a Viennese chocolate brand called Manner, which flourishes to this day. He also owned a collection of residential rental properties in Budapest, bought on the cheap in the chaos after the First World War, when the Austro-Hungarian empire disintegrated. That wealth would ultimately spare the Munk family from the German death camps in the next world war. Mr. Munk’s father, Lajos, was not a wealth creator. “As a young man in Budapest, Lajos was probably best known as being the tall, dashing son of a wealthy man, a good tennis player who summered in Lake Balaton [in Western Hungary] and the Côte D’Azur, and was something of a womanizer,” Nina said. Peter Munk was never close to his father, but was very close to his grandfather, Gabor, and especially to his mother, the former Kato Adler, also known as Katharina. Lajos and Kato divorced in 1931, and young Peter shuttled between the two households. The Munks, who were Jewish, saw their comfortable lives turn into a nightmare in March, 1944, when Hitler, sensing that the Hungarian prime minister was about to sign an armistice with the Allies, ordered the occupation of Hungary. Until then, Hungary had been a German ally. More than half a million Hungarian Jews would be sent to Nazi death camps, but Lajos and Gabor Munk would ensure that many family members would not be among them. Gabor traded what little remained of his wealth for passage on the Kastner train, the 35 cattle cars that left Budapest in June, 1944, carrying almost 1,700 Jews, among them a 16-year-old Peter Munk, his father and his grandfather. Peter’s mother, Kato, was not included on the Kastner train because she was no longer a member of the Munk family. She was deported to Auschwitz in 1944, worked as a slave in a military factory and miraculously survived. Kato was reunited with her family in Toronto after the war and died by suicide in 1988. “The most painful chapter in my father’s life was his mother’s deportation during the war,” Nina said. Peter Munk’s own journey aboard the Kastner train lasted several weeks, including a diversion to Germany’s infamous Bergen-Belsen concentration camp, before it rolled into Switzerland. For Mr. Munk’s father and grandfather, it was mission accomplished, but it came at a great cost. Three years after the war, in 1948, Mr. Munk, then 20, went on a student visa to Toronto, where he had an uncle, Nicholas Munk, one of Gabor’s sons. In the summer, to earn money to pay for university tuition, Mr. Munk picked tobacco in Delhi, in southwest Ontario, “living in a haystack but earning $13 [a day], hard work.” Full of ambition and charm, and a natural salesman if not a great student, he invented a career as a serial entrepreneur, making splashes in importing, electronics, oil, mining, luxury resorts and real estate. His first big success – and failure – was Clairtone Sound Corp., the all-Canadian maker of a hi-fi whose superb sound quality and sleek Scandinavian-inspired cabinets made it an icon of 1960s design. Hugh Hefner, Oscar Peterson and Frank Sinatra were Clairtone fans. The company was started by Mr. Munk and his partner, David Gilmour, in 1958, in a Toronto suburb. The various models were immediate hits, production soared from a few hundred units to 25,000 units a year and Clairtone listed on the Toronto Stock Exchange in 1963. “Listen to Sinatra on Clairtone stereo. Sinatra does,” was one of the company’s famous tag lines. The Art of Clairtone: The Making of a Design Icon 1958 - 1971, by Nina Munk and Rachel Gotlieb. Mr. Munk and Mr. Gilmour made the fatal mistake of moving Clairtone’s production in 1966 to Stellarton, N.S., a poor region with poor infrastructure that was entirely unsuited for manufacturing. The supply lines bogged down, production faltered, and they made a disastrous diversion into colour TVs. As the losses mounted, the Nova Scotia government refused to pump more money into the factory. In 1967, Mr. Munk and Mr. Gilmour, after begging every financial connection they had for rescue money, lost control of the company to the Nova Scotia government. Accusations of insider trading against Mr. Munk were settled out of court. After Clairtone’s collapse in 1971, Mr. Munk moved to London and he and Mr. Gilmour started a hotel and resort business in Fiji, of all places. From Fiji, they created a chain of 54 resorts around the South Pacific and in Australia. The Saudi arms dealer Adnan Khashoggi, who later would become a key figure in the Iran-Contra affair, would become one of their investors, as would the Saudi royal family. Mr. Munk never shied away from difficult projects in difficult countries. Even as he and Mr. Gilmour were building hotels in the Pacific, he responded to Anwar Sadat’s call for Western investment. The Egyptian president wanted him to build a tourist mecca and housing development a few kilometres beyond the Giza pyramids. “A lot of the infrastructure would get completed, but the project was subject to intense attacks by Muslim extremists who did not want Western investment in Egypt,” said David Wynne-Morgan, the Briton who was Mr. Munk’s long-time personal communications adviser and friend. The project was cancelled by the Egyptian government in 1978, much to Mr. Munk’s anger. He sued the Egyptian government in a case that eventually reached an international court in The Hague, where he was awarded a US$18-million settlement. “Peter Munk never gave up,” Mr. Wynne-Morgan said. Mr. Munk returned to Canada in 1979, only to find that the Clairtone fiasco had not been forgotten on Bay Street. “They treated me like a fugitive and a loser,” he told Mr. Newman. Next up was energy. Mr. Munk formed Barrick Petroleum in 1980 to get into the oil game. A few years later, Barrick transformed into a mining company with the purchase of small gold mine in Northern Ontario. Barrick became a mergers and acquisitions juggernaut, consolidating the Canadian gold mining sector before branching out into the United States and Africa. The roll-up made Barrick the owner of Lac Minerals, Nevada’s Goldstrike mine, Homestake Mining and Placer Dome. Peter Munk speaks in Toronto in this 1994 file photo. CFO Jeremy Garbutt, Chairman and CEO Peter Munk and company president Robert M. Smith (left to right) examine a model of the Goldstrike mine in Nevada at American Barrick Resources Corp.'s annual meeting in Toronto on May 9, 1989. Barrick was a huge success. In 1993, 10 years after Barrick’s initial public offering on the Toronto exchange, $1 initially invested in the company was worth $158. The buying spree worked until Barrick deeply wounded itself with the overpriced, $7.3-billion purchase in 2011 of copper company Equinox Minerals. Equinox and gruesome cost overruns at the high-altitude Pascua-Lama gold project in the Andes nearly crippled the company. In 2014, Mr. Munk tried to merge Barrick with rival Newmont Mining of Denver, a deal that would have created the BHP Billiton of the gold industry. But squabbling over who would manage what and where – Toronto or Denver – apparently sunk the deal. In parallel with Barrick, Mr. Munk made a fortune in commercial property through the purchase and expansion of TrizecHahn, then the owner of Toronto’s CN Tower, Chicago’s Sears tower and Montreal’s Place Ville Marie. (Mr. Munk is often referred to as a “billionaire” but said the label was a media exaggeration, and Nina Munk said he never bothered to measure his wealth.) The company was sold in three stages. The biggest chunk went for US$8.9-billion in 2006 to Brookfield Properties and Blackstone, the American private-equity group. After the sale, Barrick and the transformation of Porto Montenegro from a wasteland into dazzling yacht harbour occupied most of Mr. Munk’s time. Among his many honours, Mr. Munk was promoted to companion of the Order of Canada in 2008, received the Canadian Club Lifetime Achievement Award in 2011 and decorated with the Hungarian Order of Merit’s Commander’s Cross with Star in 2016. Mr. Munk has left the vast majority of his fortune to the Peter & Melanie Munk Charitable Foundation, which has distributed almost $300-million to charity, mostly to health care and education, although some $41-million went to Technion, the Israel Institute of Technology. The donations can be considered his gifts to Canada, his adopted home and the country whose generosity, fairness and opportunities always amazed him. He leaves his wife, Melanie; son, Anthony, who is a senior managing director at Toronto’s Onex Corp.; and daughter, Nina, an author, journalist and contributor to Vanity Fair. Anthony and Nina are the children of his first wife, Linda, who died in 2013. He also leaves Natalie and Cheyne, his daughters from his marriage to Melanie, and Marc-David Munk, Linda’s son by another marriage, who was welcomed into the extended Munk family. Marc-David is a physician and the chief medical officer at Iora Health in Boston. Peter Munk also leaves his half-brother, Paul Munk, who is a pediatrician in Toronto. 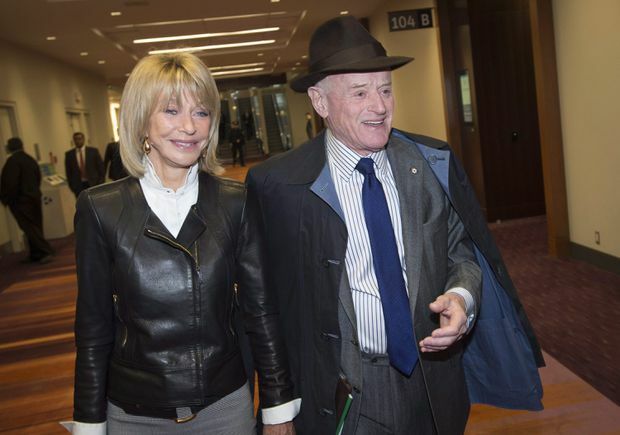 Peter Munk arrives with his wife Melanie at Barrick’s annual general meeting in Toronto on April 30, 2014.